Service Proven by the U.S. Border Patrol, D.H.S., Police and Sheriffs across the country! Keep your engine — and your cabin cool, with more power and better gas mileage! Dyno tests prove increased horsepower – – which also means better gas mileage. For V-8’s: Crown Vics, Chargers, Tahoes, Explorers (V-8), Durangos, Expeditions, Pickups – use Size Large Hi-Flow. For V-8’s, and Full-Size Vehicles as above, can also use Size Long. For More Severe Duty (K-9 Units Really Like These) — Use Size XL. The Best Way to Cool Police Vehicles! 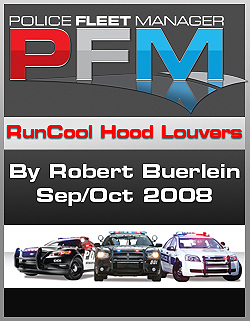 Don’t Pop Your Hood to Cool Your Engine – Get RunCool Hood Louvers!!! Law enforcement vehicles, in particular, are subject to high-temperature extremes under the hood. Heat is the mortal enemy of the engine and all the components under the hood. And that heat RADIATES into the firewall, transmission and INTO THE CABIN! Hot air rises, so let it out with patented RunCool® Hood Louvers! — Chief Bill Sala – Luling, Tex. P.D. Size Large RunCool Hood Louvers on U.S. Border Patrol pickup. This is an early installation (Standard Flow). We developed the Hi-Flow version for them — 50% more louvers per panel for 50% more flow — needed when it is 150° in the desert! Note roll bar and extended stand for scanning the desert. A man recently called from New Mexico and asked about our Hood Louvers. His F250 was overheating, towing in hot weather. He said, “I saw a U.S. Border Patrol vehicle with hood louvers and asked the Border Patrol Agent, “Where did you get those hood louvers?” He said, “Call RunCool Hood Louvers”. And, I did! And, I’m glad I did! Increase vehicle reliability and performance and improve the service life of underhood components with RunCool patented Hood Louvers. Various types of U.S. Border Patrol vehicles use these in the desert, where the temperatures can reach 150°! They want their Agents to be able to run the A/C (especially with K-9 vehicles) when temperatures reach those high levels. “It is unbelievable how well they work. I would never believe the difference they could make.” In fact, testing by the Pelion, S.C. Police Department showed our hood louvers lowered under-hood temperatures by 47°. The best way to cool hot engines! 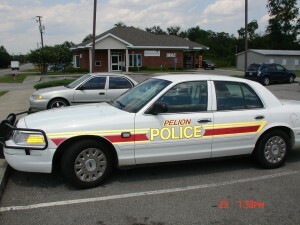 Close up of the Pelion, S.C.P.D. hood louvers. These are Size Large, with 12 louvered openings per panel. Since then, we have introduced the Hi-Flow version, with 19 louvered openings per same-size panel; 50% more louvers and more flow at only 20% more in price. The U.S. Border Patrol and Police Department and Sheriffs’ Offices across the country , use our Size Large, Hi-Flow™ Hood Louvers on Crown Vics, Tahoes, Chargers, F-150s, etc., powder-coated white or black to match their vehicles (with matching-color pop rivets included). Call for the special Law Enforcement Discount Price. Usually in stock, and we’ll ship them right out, then invoice you. 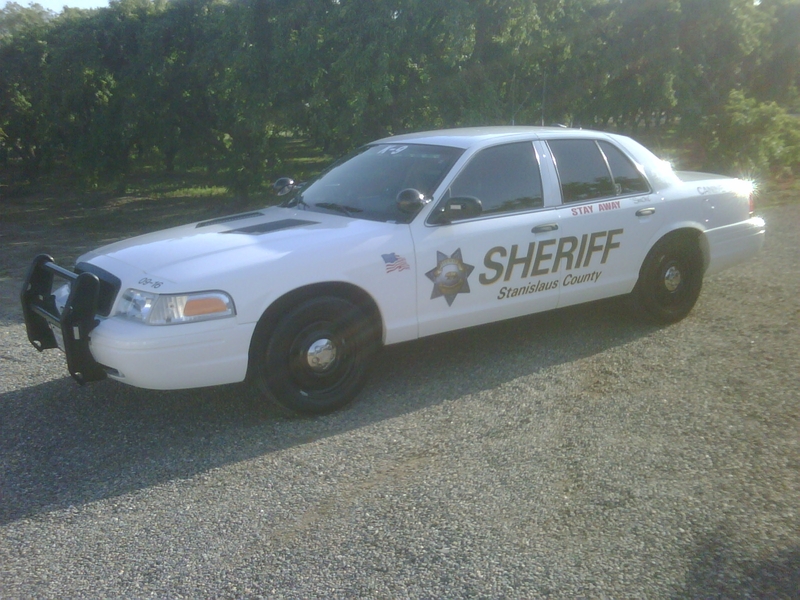 They are easy to install, they work, and we are experienced with Law Enforcement agencies! Over 95% of civilian customers install them themselves in their home garage. Most agencies install in their own car shop. Some agencies have their local car shop or tire shop install them. Some officers install them, themselves, at home! Cheap ‘Life Insurance’ for Your K-9 . . .$179 (for a set of RunCool® Hood Louvers)… One Time Only – not once a month (like life insurance). Remind the Chief or the Sheriff: A replacement K-9 costs $5,000 - $15,000, vs. $179 to $ $225 (Law Enforcement Discount) for a set of RunCool Hood Louvers. Which would we rather pay? In use on K-9 Vehicles of the USBP (over 10 years, and still installing), BATFE, DHS and Police and Sheriffs’ Offices across the U.S. To learn more and/or order, see “Police” tab on HoodLouvers.com. (While on there, request free “K-9’s Lead the Way”™ bumper sticker for your K-9 vehicle and/or your P.O.V. SUBJECT: Saving money, saving K-9’s – and avoiding Department embarrassment and backlash from the community and news media. 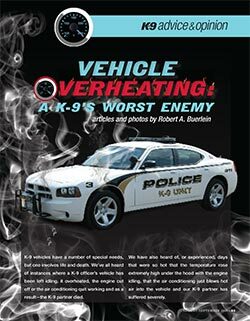 1) Overheating kills dozens of K-9’s, nationally, each year. 2) If a K-9 Partner dies on our shift, the local newspaper makes you look like pet killers, disrespectful messages come in from the community – and the Mayor gets hot under the collar with you. 3) A replacement K-9 costs $5,000 - $15,000, and that is “non-budget “ expense. 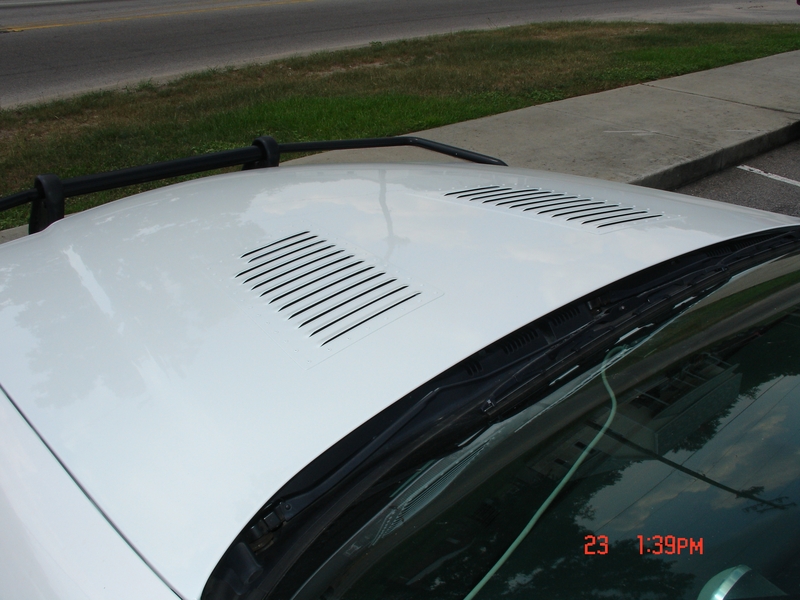 4) To help avoid this, the USBP (a customer for the last 10 years – and regular/on-going buyer/user) and many Fed agencies (including DHS) and Law Enforcement agencies across the U.S. install RunCool Hood Louvers – especially on K-9 Vehicles. 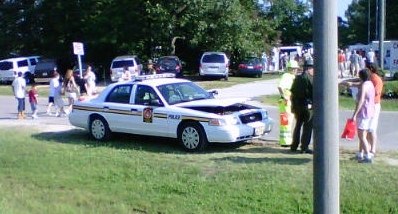 They let the hot air out of the engine bay and, in turn, lower the in-vehicle temps., to avoid overheating K-9’s. Many racecars use these – less driver fatigue/longer engine life/less vehicle downtime. 5) Bottom Line: A replacement trained K-9 costs $5,000 - $15,000, vs.$179 (Size Large) - $225 (Size XL) for a set of USBP/Police/Sheriff-proven RunCool Hood Louvers. As I understand the budgeting process,you would rather pay $179 - $225, one time, rather than possibly being hit with a surprise $5,000 - $15,000 expense. 6) Recommendation: Try a set on one of your K-9 Vehicles. Save a lot of hassle for you, for your K-9 Division and for your K-9 Partners – cheap ‘insurance’ (but a one-time pay, not monthly, like insurance). Let the Killer heat out of the engine bay – and cool the entire K-9 Vehicle! Desert proven, and used by, the USBP! “You have to keep the engine cool if you are going to keep the A/C cool, and you have to keep the A/C Cool if you are going to keep the dog cool! These do the job!” – K-9 Officer, Ariz.
After an engine runs for an hour, “Heat Soak” heats up all the components of the A/C system – 95% of these are in the hot engine compartment or on the firewall which also is within a few inches of the hot engine. The firewall heats up, then the transmissions heats up, which heats up the transmission hump. The firewall and the transmission hump total more than 30 sq. ft. of surface area which get hot and, in turn, radiates that heat directly into the passenger compartment! In other words, you’re sitting behind and above a powerful “Radiant Heater”! Our Run Cool Hood Louvers greatly lower temperatures in the engine compartment (by 47° according to Police testing), the source of this heat. In turn, lowering the temperature in the passenger compartment, keeping the K-9 (and you!) cooler!